But Chen himself has taken a different path. Today, he’s a graduate of Yale SOM and the cofounder and CEO of a startup called Saphlux, which develops and manufactures components for next-generation LEDs and lasers. He’s now juggling design, production, marketing, vendor negotiations, and client relations. He’s drumming up financing for the firm ($11 million and counting to date). He’s jetting half a million kilometers a year in the process. And he’s enjoying every chaotic minute of it. He decided he needed to know more about business to make that leap. So in 2014, he left Schlumberger and began an MBA at Yale SOM. He figured he’d likely start his own company eventually. But “eventually” turned out to be within weeks of his arrival in New Haven. 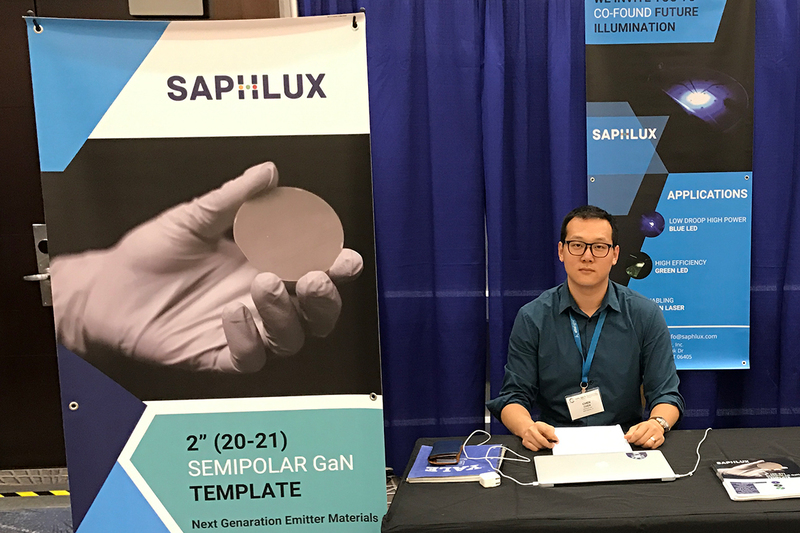 He met Yale engineering professor Jung Han at a panel discussion for SOM students, the two hit it off, and in short order the focus of Han’s research became the core of Saphlux’s product line. That product is a semiconductor wafer made of innovative materials that eliminate polarization and “significantly boost…output power, efficiency, and wavelength stability,” as the company website explains it. Chen spent the rest of his two years at Yale SOM taking every entrepreneurial class he could, while working with Han to launch the firm. During winter break of his first year, Chen started lining up financing, and by the time he graduated in 2016 the firm had its first product ready to go. “It was quite hard, I have to admit,” Chen says. He thought about taking a gap year but ultimately toughed it out. He’s effusive in his appreciation for what he learned at Yale SOM and the support he got from the school’s Program on Entrepreneurship, if regretful that his focus on starting Saphlux kept him from spending more time with his classmates. Chen was already an accomplished engineer, but the school gave him the management fundamentals and the leadership skills to run a business. Meanwhile, he was taking advantage of the expertise that surrounded him. “I really got a lot of help from my professors and also my classmates—many of them had experience in financing ventures, in different fields,” he remembers. Compared to Schlumberger, Saphlux is still tiny, with about 30 employees. But it is a rising star. It counts among its customers “a lot of big names,” says Chen, like Philips, Osram, Mitsubishi, and Sony. “My customers say we’re the only company doing this in the world,” he adds. “They admire what we did. There’s a lot of risks, technically and businesswise. But we’ve come far. While most young companies start in a local market before even thinking about expanding globally, Saphlux was entering a field where a global approach was required. “One thing we did uniquely is we started internationally,” Chen explains. “The semiconductor industry is so mature that a lot of companies in the supply chain are global. So our vendors were from Japan, China, Korea, Taiwan, U.S., all different places, even from day one.” That means a grueling travel schedule for Chen. During one recent month, he flew from New Haven to Texas, then to two cities in California, three cities in Japan, four cities in China, on to Korea and Taiwan, and finally back to the U.S. The course he’s charted isn’t easy, he’s quick to admit. “When I talk to current SOM students who want to do a startup, I tell them, ‘If you don’t really enjoy this, a startup is not the best choice, because you suffer a lot.’ There’s so much uncertainty—you ride a roller coaster every day. Not quite five years into his entrepreneurial journey, Chen sees himself staying the course with Saphlux. “We did a study showing that the financial return in partial ownership is not as good as if you do an IPO or licensing,” he says. But he and Han are fine with that. “We want to develop a product instead of just licensing it or selling out to a bigger company,” says Chen.